Scooper - Technology News: The way the world produces and consumes energy is changing. How can we meet the needs of the future? The way energy is produced, distributed and consumed around the world is undergoing fundamental change of almost unprecedented proportions. This is commonly referred to as the “energy transition”. Both reports consider the relationship between their indicators and indicators of governance, using the Worldwide Governance Indicators (WGI) . That work, produced as a cooperation between the World Bank and the Natural Resource Governance Institute, says: “Governance consists of the traditions and institutions by which authority in a country is exercised.” The WGI considers six dimensions of governance. 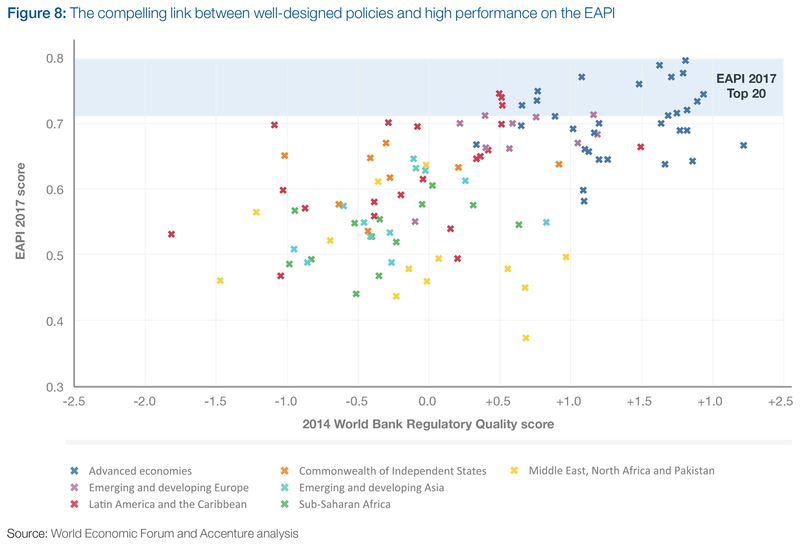 The two energy reports focus their brief analysis on “regulatory quality” and “rule of law”. Many countries struggle to upgrade their energy systems to fully support current and future requirements of energy security and access, sustainability and economic growth. All of this takes place against a backdrop of economic power (and associated energy demand) shifting from developed to developing countries; political power shifting from the nation state to sub-national and supra-national entities; and processes of innovation broadening from large incumbent firms to agile newcomers. This is shifting the shape of the geopolitics of energy and changing the vocabulary used to describe it. While traditional issues of energy such as commodity price volatility and physical security of supply remain salient, the elements of the energy transition - including a focus on clean energy - require decision-makers to look beyond static approaches. During a private session at the World Economic Forum Annual Meeting 2011, 90% of participants, consisting of executives of the world’s largest energy companies, policy-makers and thought leaders from across the energy value chain, expressed a belief that significant change is underway in energy architectures around the world. Almost a third said they believe the world has reached an inflection point marking a radical shift in the way we source, transform and consume energy. While the pressures and possibilities for change in energy architecture are at a historic height, what is less clear is the shape the transition will take. What will the new energy architecture look like? What enabling environment will create the most effective transition towards an energy architecture needed to meet tomorrow’s energy requirements both globally and for different countries? How can we ensure that the new architecture goes further to underpin the sometimes competing needs of economic growth and development, environmental sustainability, and energy access and security? Out of this discussion a set of global indicators that form the EAPI emerged. The EAPI is produced by a joint team from the World Economic Forum and Accenture. It goes largely under-the-radar of mainstream energy discussions, but offers a useful set of insights on the massive transitions we are witnessing in the energy space. In 2016, the report said: “The stage has been set for a fundamental reshaping of energy systems and associated infrastructure (…) Scattered signs of progress are evident.” Those signs are increasingly visible. 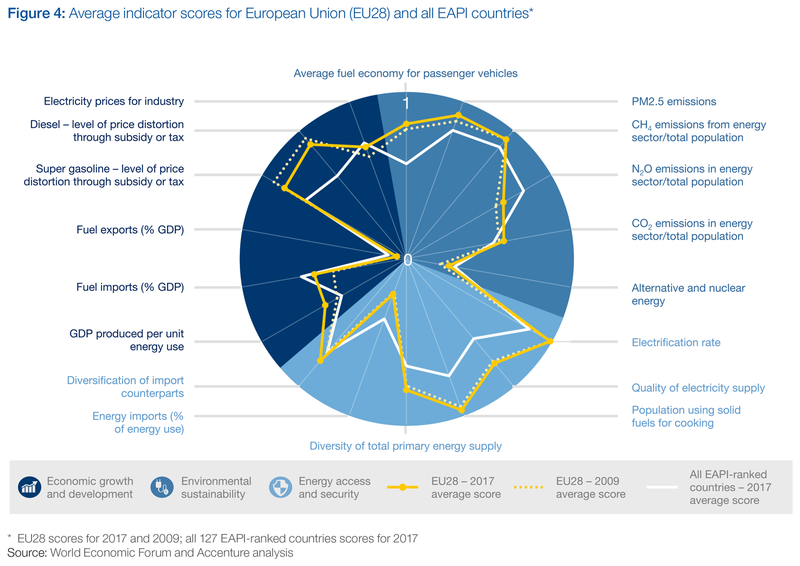 The various sub-indicators under the headings are shown for the EU28 as well as the wider countries in the chart below. A change of this magnitude for energy systems will not be feasible without a suite of strategic tools that help us understand different pathways to the future. Of course, both sets of indicators discussed here are highly abstracted and not meant as a comprehensive treatment or classification of an energy system. Rather, they each attempt to present and consider the complex information and the highly interdependent issues that prevail in the energy sector. It is clear that there are now several efforts to take stock of the energy system and those efforts point to a central role for governance. Understanding the relationship between those results and the basics of governance and regulation in countries can help decision-makers and investors. More detailed analysis could be conducted by using other methods of correlation or using other dimensions such as “government effectiveness” or “control of corruption”. Ensuring the momentum of positive change in energy systems continues and is supported will require reinvigorated efforts on governance issues. The Global Energy Architecture Performance Index 2017 is available here .